Nissan introduced a revamped Versa for the 2015 model year, but the word “revamped” is a bit of a stretch given the minor changes that took place for 2015. On the outside, the grille now has a curvature to it, and the air inlet on each corner of the fascia has been opened up a little more. The headlights now have a new shape and design, but are a bit uglier than before, and the same goes for the taillights in the rear. Inside, the instrument cluster now has LED backlights, and the center stack has a slightly refreshed look to it. The steering wheel has also been revised to offer audio and hands-free calling controls. Under the hood, the 2015 Versa carries on with the same, boring 109-horsepower, 1.6-liter four-cylinder. As you can see, Nissan did very little to the Versa for 2015 but, considering it is the cheapest model in its segment, it still has a lot going for it. 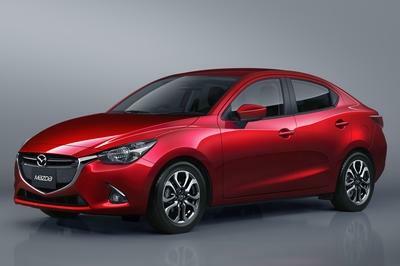 Plus, you can add the fact that for a compact, it does offer pretty comfortable seating for five people. The biggest problem Nissan faces is that, despite its starting price of just $11,990, competing models that cost just a little more come better equipped. Of course, the car is aimed at young buyers with a limited budget so the Versa may be able to carry on for a couple more years. The Versa sedan’s primary competitors include the Ford Fiesta Sedan and the Kia Rio Sedan, both of which are priced a bit higher, but offer up a little more for the taking. If you’re interested to know just how well the Versa competes, check out our full review below. 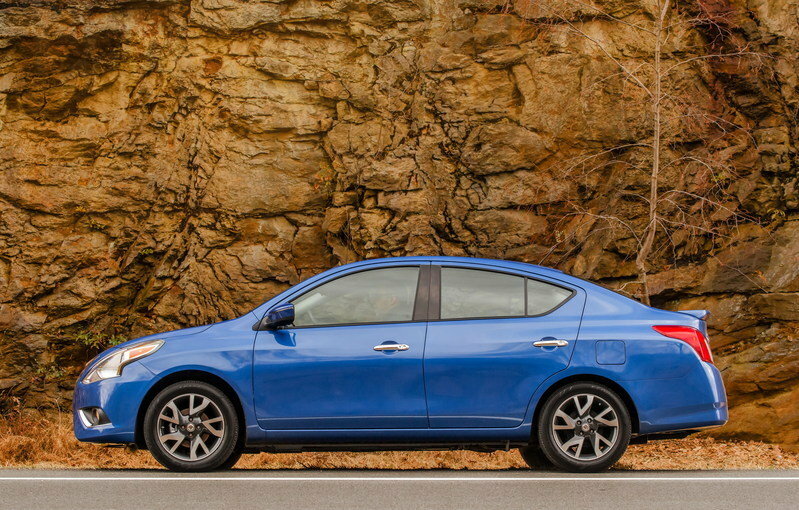 Click past the jump to read more about the 2015-2016 Nissan Versa Sedan. Not a whole lot of significant changes were done on the outside of the Versa Sedan, but a close inspection will reveal a couple of things. 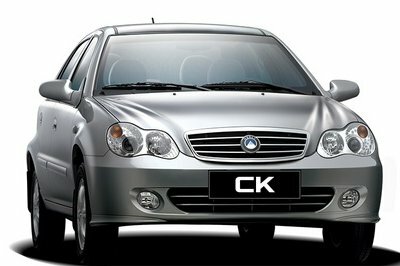 Chief among them are the redesigned headlights and the front grille, which now come with a standard chrome plating. 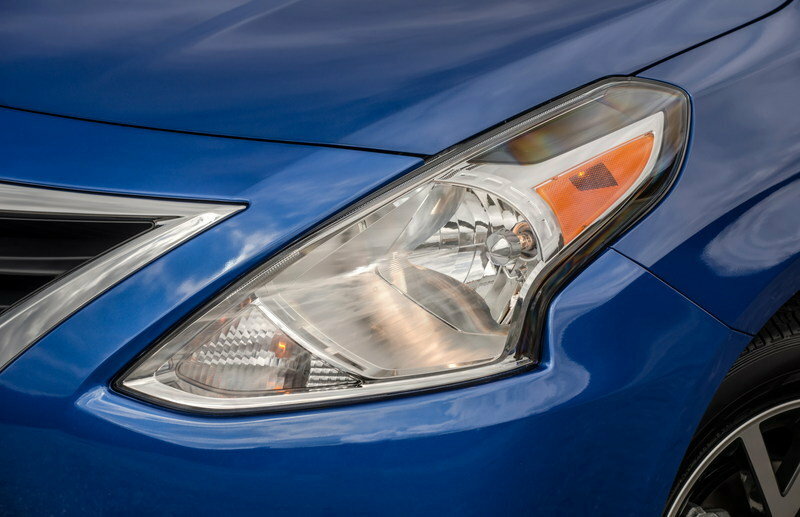 That’s the extent of what you’re going to get on the front section of the 2015 Versa Sedan. Meanwhile, the rear section of the sedan also received tweaked taillights to go with a sportier rear bumper. The higher trim SV and SL models also gets the benefit of a new fog light-finisher design, new side mirror designs, and a new set of 15-inch V-spoke aluminum-alloy wheels. There aren’t enough changes to blow your mind, but the subtlelties are there to make for an improved sedan. Then there's the new steering wheel, which now carries standard audio and Bluetooth Hands-free Phone System controls. The 2015 Versa Sedan prides itself on having the most legroom of any other sedan in its class. Hard to make a case considering the market it’s in, but the Versa does offer comfortable five-passenger seating. The new shape of the center stack is also a welcome refresh, as is the revised meter display that now proudly carries a white LED display that’s been changed from the orange lighting of previous models. Then there’s the new steering wheel, which now carries standard audio and Bluetooth Hands-free Phone System controls. Like the exterior, the changes are small enough to be indistinguishable to some customers. But dive a little deeper and you’ll notice them. No changes were made to the engine, either. So prepare yourself for the same 1.6-liter inline four-cylinder engine that produces just 109 horsepower and 107 pound-feet of torque while mated to a five-speed manual transmission. optionally, you can equip the Versa with a four-speed auto or Nissan’s Xtronic CVT. Fuel economy isn’t particularly impressive at just 27 mpg in the city and 36 mph on the highway with the manual, but the CVT puts it at a more sub-compact-like 31 mpg city and 40 mpg highway. Nissan is offering five trim options for the Versa, starting with the 1.6 S, which has a price of just $11,990. Even the top-of-the-line trim, the 1.6 SL, retails for only $16,890, continuing the Versa’s distinction as the cheapest (new) car in the U.S. Even with all of the options checked off and a few of the more common accessories added in — no, I left off the $12 valve stem caps that will be lost at the first tire change — the Versa came in at a thrifty $19,915. It’s hard to argue against the starting price of the Nissan Versa Sedan because it’s cheaper than just about any other car in the US. But the Ford Fiesta Sedan makes its own compelling case. For one, the new Fiesta’s exterior styling is now much more approachable, with big-car cues in its grille and nose that are designed to make it seem larger than it is. That’s a pretty big deal considering that cars of this segment aren’t usually the type to have some enviable appearances. On top of that, the Fiesta Sedan also has a choice of engine, something the Versa doesn’t have. With it, customers can choose from a 1.0-liter EcoBoost that produces 123 horsepower and 148 pound-feet of torque or the more popular 1.6-liter inline-four that only has 120 horsepower and 112 ponies at its disposal. Both figures still represent better output compared to what the Versa is capable of. Then again, with a base price of $14,000 for the S Sedan trim all the way up to $18,200 for the Titanium Sedan trim, the Fiesta Sedan still can’t call itself cheaper than its Nissan counterpart. 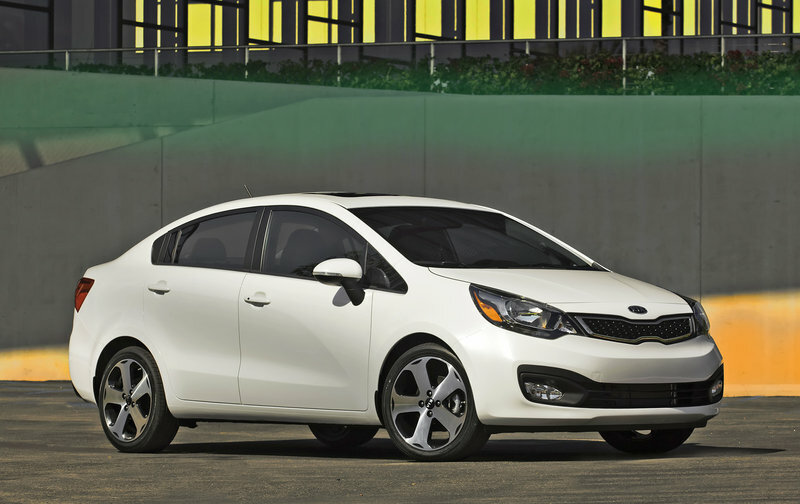 You can make a case that the Kia Rio is one of the best values of its segment. Sure, the base price of $13,900 is still more expensive than the Versa Sedan, but for what you get, there’s a lot more value to the Rio than most cars of this segment. 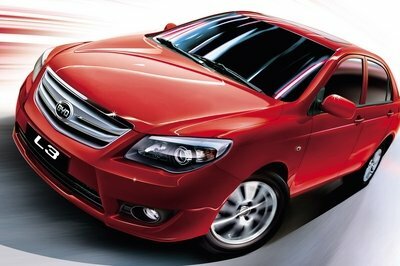 The attractive aesthetics and the comfortable interior are only two pieces to the Rio’s puzzle. More impressive is the fact that it also carries a 1.6-liter inline-four engine that produces 138 horsepower and 123 pound-feet of torque with fuel efficiency at 27 mpg in the city and 37 mpg on the highway. Those are the same returns you can get with the Versa Sedan with extra ponies attributed to the Rio. All that and you have a car that only costs $13,900 with a top-of-the-line model at $17,900, a little over than what you’re paying for with the Versa Sedan. 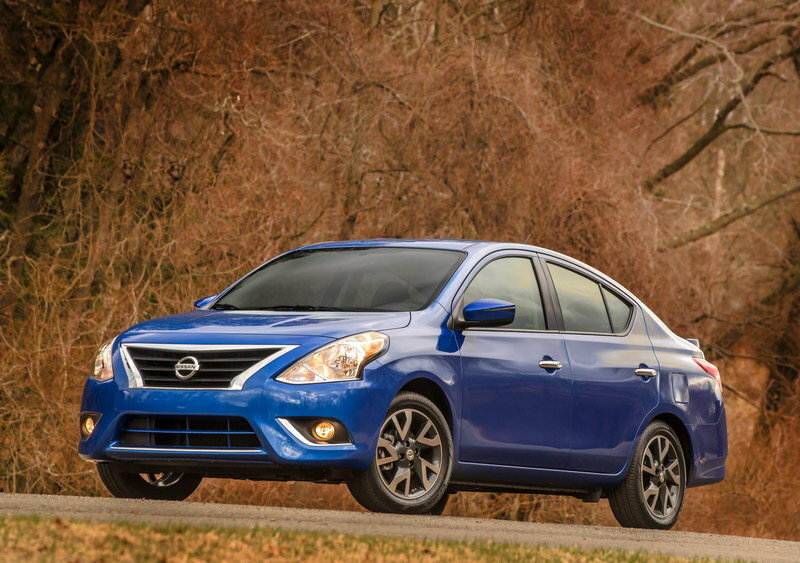 Nissan isn’t pulling any punches with the Versa Sedan. It knows what it has and its determined to make it as successful as possible. Having the cheapest price of any car in the US is a huge plus, but what do you really get with all of it in the end? Models like the Rio 5-Door and the Fiesta Sedan may be a little more expensive, but there’s more upside with those two models than what the Versa Sedan has. In the end, we’ll settle for paying the added money on the price because the long-term benefits are much more exciting. Nissan today revealed photography and details of the new 2015 Nissan Versa Sedan, the best-selling vehicle for four years in a row*** in the highly competitive sub-compact segment. The 2015 Versa Sedan makes its debut next Wednesday, April 16th at the New York International Auto Show – the same day it arrives at Nissan dealers nationwide. The enhancements for the 2015 model year include new front and rear fascias, a range of interior refinements, and new grade level and packaging content. "Versa Sedan is the entry point for the dynamic Nissan sedan lineup, attracting many first-time new car buyers to the brand," said Pierre Loing, vice president, Product Planning, Nissan North America, Inc. "It’s critical that we keep Versa’s look and feel fresh and its value equation high, with a rewarding driving and ownership experience." 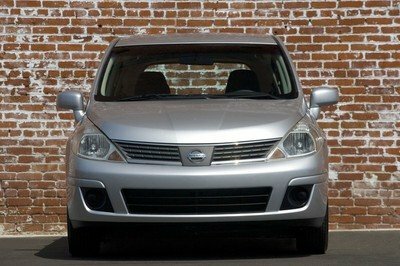 Most prominent of the changes is the bold new front end treatment anchored by larger headlights, a more substantial looking fascia and standard chrome plating on the grille – all of which strengthen the family ties of the Versa Sedan with the Nissan stable mates – Sentra, Altima and Maxima. The list of exterior upgrades also includes a new fog light finisher design, new side mirror designs for SV and SL trim levels (with integrated turn signals for SL), and a more dynamic rear fascia design. A new, Versa Sedan-exclusive 15-inch V-spoke aluminum-alloy wheel design is also available with SV models. 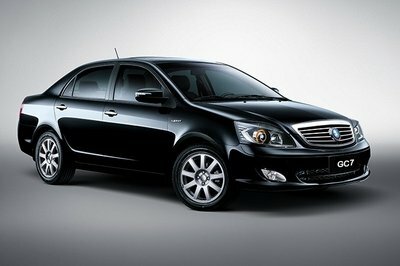 Versa Sedan again offers five-passenger practicality with a high degree of comfort and refinement. Interior enhancements for the 2015 model year include a new center stack shape, which is similar to that found on the sporty Versa Note, a revised meter display with white LED display (previously orange illumination color) and a new, more substantial, steering wheel with standard audio and Bluetooth® Hands-free Phone System controls. 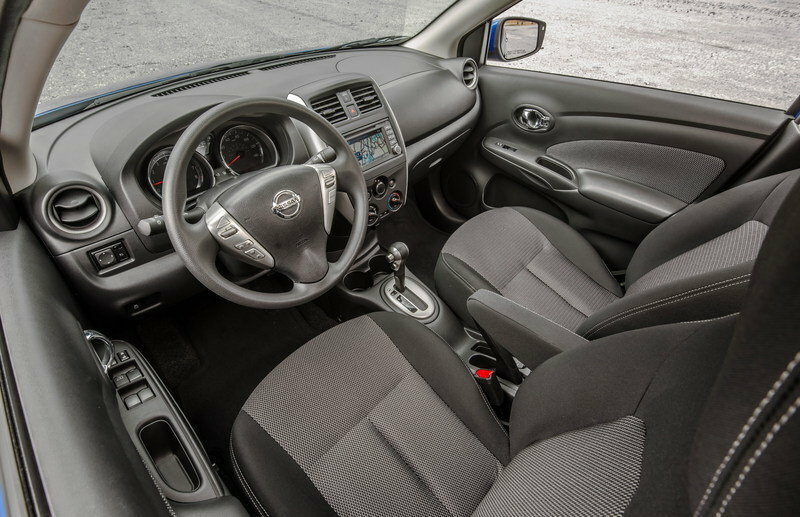 Versa Sedan S and S Plus grades feature a wide AM/FM/CD audio system with standard auxiliary-in and Radio Data System (RDS), standard assist grips, a passenger-side vanity mirror and new seat fabric. "Like the exterior changes, the interior refinements provide a more substantial, higher quality look and feel," added Loing. All 2015 Versa Sedans continue to provide a roomy interior volume of 90.2 cubic feet, with more rear legroom than many mid-size sedans. Trunk volume measures 14.9 cubic feet. A 60/40-split fold-down rear seat is standard on SV and SL models for even greater cargo versatility. The NissanConnectSM with Navigation and Mobile Apps system, which is offered as part of the SL Technology Package, includes a 5.8-inch color touch-screen display, Nissan Voice Recognition for audio and navigation, SiriusXM Traffic and SiriusXM Travel Link (SiriusXM subscription required, sold separately). 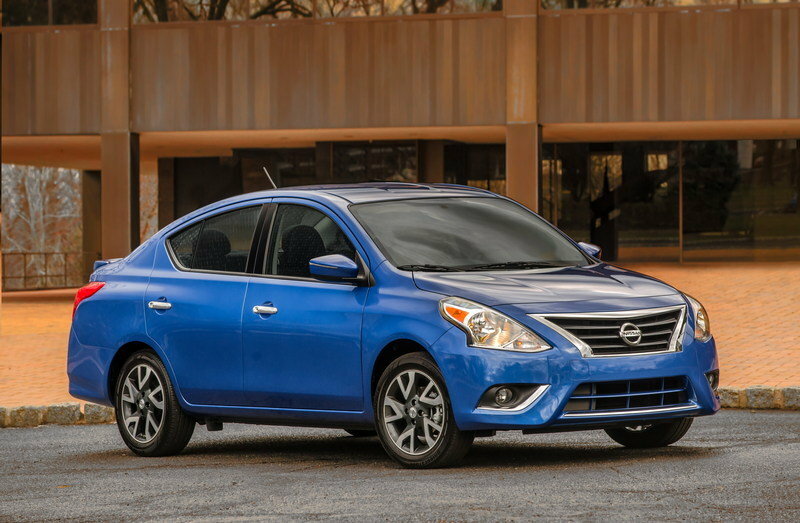 The 2015 Versa Sedan utilizes Nissan’s global lightweight "V" platform and is powered by a 1.6-liter HR16DE 4-cylinder engine rated at 109 horsepower at 6,000 rpm and 107 lb-ft of torque at 4,400 rpm. The 1.6-liter engine is matched with a choice of three transmissions – a 5-speed manual transmission or 4-speed automatic (S models only), or a next-generation Xtronic transmission with D-mode step shift programming. 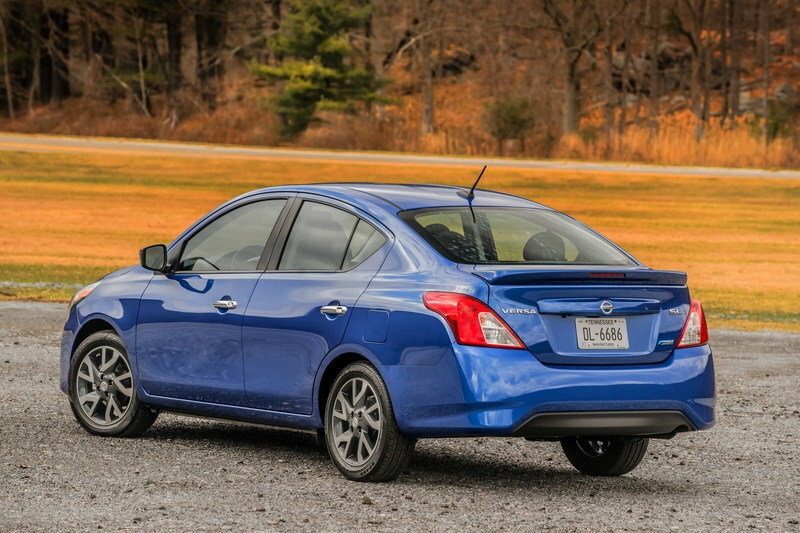 Fuel economy for the 2015 Versa Sedan is rated at 31 mpg city, 40 mpg highway and 35 mpg combined with the Xtronic transmission. Versa Sedan models equipped with the 5-speed manual offers 27 mpg city, 36 mpg highway and 30 mpg combined, while the 4-speed automatic-equipped models are rated at 26 mpg city, 35 mpg highway and 30 mpg combined. The 2015 Nissan Versa Sedan is available in four well-equipped models – Versa Sedan S (offered in 5MT and 4AT versions), Versa Sedan S Plus (Xtronic only), Versa Sedan SV (Xtronic only) and Versa Sedan SL (Xtronic only).